Create, upload, view, and delete documents stored in SharePoint from within Microsoft Dynamics 365. Use the SharePoint document management abilities within Microsoft Dynamics 365, such as checking the document in and out, viewing version history, and changing document properties. Enable non-Microsoft Dynamics 365 users, such as customers who want to review a bid, to directly access the SharePoint documents, provided they have the appropriate permissions. This topic is for organizations who wish to deploy for the first time or upgrade to server-based SharePoint integration. After you enable server-based SharePoint integration, you can’t revert to the previous client-based authentication method. For some organizations, using the Microsoft Dynamics CRM List Component solution might be a better choice. 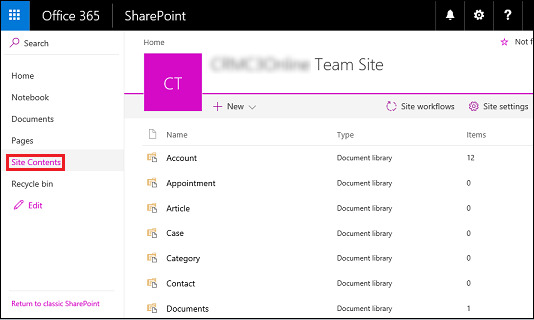 More information: Configure SharePoint integration using the list component. To set up Dynamics 365 (online) to use SharePoint Online, complete the following steps. Your Microsoft Dynamics 365 (online) and Microsoft Office 365 users are not automatically allowed access to your SharePoint sites. 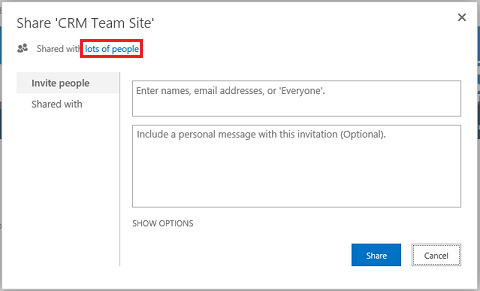 You must work within the SharePoint site to assign specific permission levels to individual users or groups. Browse to the Office 365 admin center and sign in using Office 365 Global administrator credentials. Open the Office 365 app launcher, and then click SharePoint. 3. On the left-side menu, click Team Site. On the Home page, click SHARE (upper-right corner). To view the default permissions for your team site, click lots of people. By default, all users in your Microsoft Office 365 organization are able to add and edit documents on the Team SharePoint site. To invite others, choose Invite people and add people external to your organization to share documents. For Dynamics 365 (online) organizations, Microsoft Dynamics CRM Online Spring ‘14 introduced a new server-based (using server-to-server authentication) SharePoint integration that removes the need to install or continue to use the Microsoft Dynamics CRM List Component solution. If you are a new organization and have not yet deployed document management, see Configure a new organization. 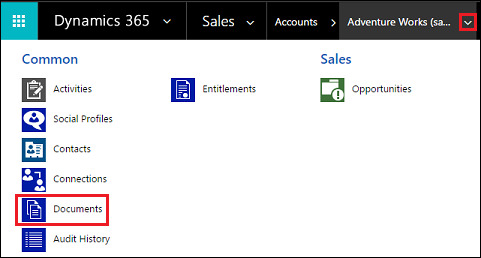 The Microsoft Dynamics CRM List Component builds the SharePoint library using the internal name of the document-enabled entity in Dynamics 365. Server-based SharePoint integration uses the entity display name. When you upgrade to server-based SharePoint integration, be sure to check that the display names in your document library on SharePoint match the entity display names in Dynamics 365. More information: "Validation Error" when you try to configure server-based SharePoint integration for Microsoft Dynamics CRM Online and SharePoint Online. If your Dynamics 365 organization has not deployed document management, when a Dynamics 365 System Administrator logs in an alert message will be displayed to enable server-based SharePoint integration. If you don’t see the alert and have not previously enabled server-based SharePoint integration, clear your browser cache or open Dynamics 365 using Internet Explorer with InPrivate browsing to have the alert display again. Once you configure server-based integration, the alert will no longer appear. In the Enable Server-based SharePoint Integration alert click Next. Choose Online for where your SharePoint sites are located, and then choose Next. 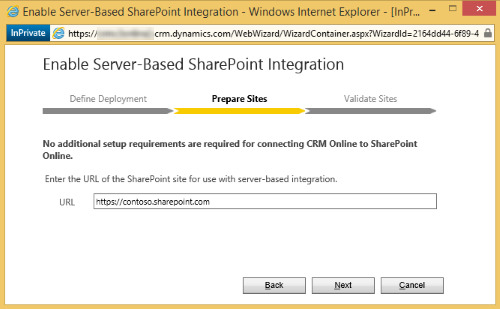 If your Microsoft Dynamics 365 (online) is not connected to a SharePoint online site, enter the URL (for example https://contoso.sharepoint.com) of your SharePoint site that you will use for auto folder creation, and then choose Next. To see your SharePoint site collections, in the Office 365 admin center, click Admin centers > SharePoint, and then click site collections. The URL will be checked for being a valid SharePoint online site and for existing in the same Office 365 tenant as your Dynamics 365 organization. 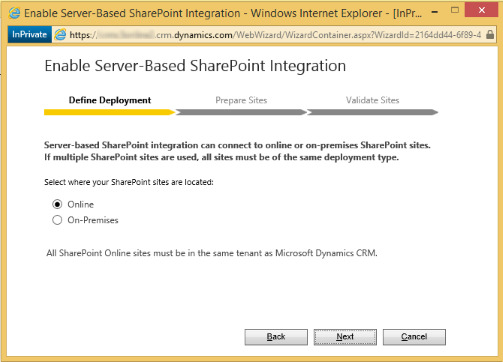 After enabling server-based SharePoint integration you can’t go back to the previous client-side integration. Choose Enable. After you enable server-based SharePoint the options to Install List Components and to enable server-based integration will no longer appear as an option in Document Management. You are now ready to add document storage locations to the entities you enabled above and start managing documents. Begin by opening a document management-enabled record (for example, Contact). Browse to your Microsoft Dynamics 365 (online) web application. Choose an account, such as the Adventure Works sample account. On the nav bar, click the down arrow next to the account name, and then click Documents. 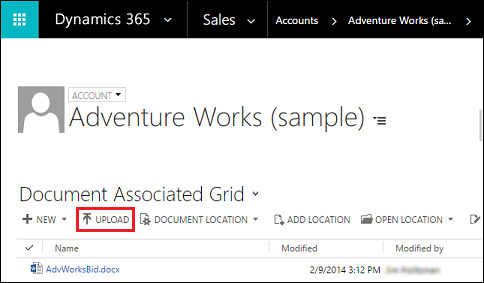 Click Upload, and then browse to a document to upload to the new folder in your Microsoft Office 365SharePoint Online Team site. 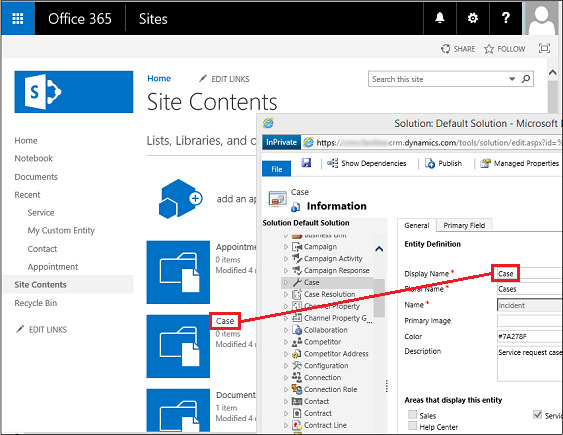 Select a Dynamics 365 folder location, and then click Ok.
To see the document in your Microsoft Office 365SharePoint Online Team site, click to the left of the document name (you’ll see a check mark), and then click Open Location. Click Site Contents to see all the document libraries created for the managed entities you selected. The entities you selected to be managed by Document Management appear as document libraries (for example: Account, Article, Case, Lead, Opportunity, Product, Quote, and Sales Literature).